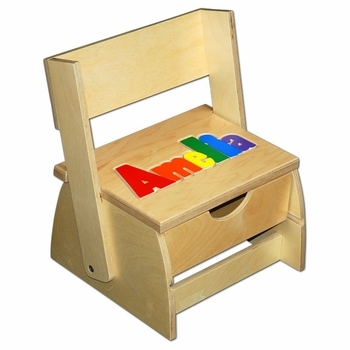 This functional, made in the USA, built to last a lifetime chair combines a flip-up step with name puzzle and a handy storage drawer. Puzzle letters can be painted in primary or pastel colors. You have the option to add two educational board books to help teach the alphabet and colors. If desired, we can engrave a special message or baby’s birth information on the back of the flip step as well. Please note that the engraved area is limited to 9 lines with a maximum of 30 characters per line and a total of 300 characters including spaces. Please click on More images above to see more photos of all the different available options. Each flip chair is made using sturdy Baltic Birch, a high grade hardwood for strength and longevity. All paints and finishes are water based and non-toxic. Sized perfectly for kids. the seat dimensions are 9 by 12 inches and 8 inches high. The flip step is 15 inches high when in the upright position.